As a general introduction today we will look at two US Treasury Yield curves. The first Yield curve in the Curve graphic 1 below is the 3 Month bills compared to the 10 Year bills over the last 5 years. In this table it is clear that the current 10 Year rate of 2.82% as of 29 July 2011, is still well below the 5 year average rate. 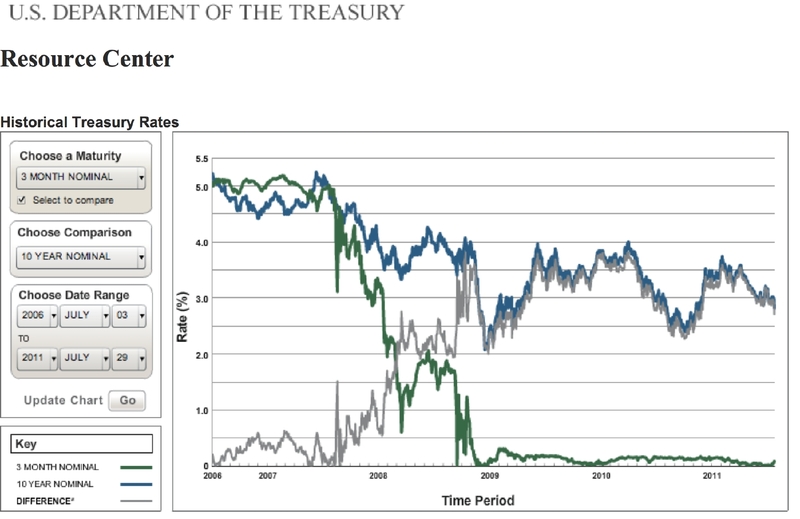 The trend of the 3 Month bills, especially over the last few months has drifted aimlessly between 0.15% on 28 February 2011 and currently at 0.10% on 29 July 2011. 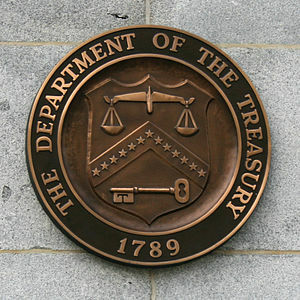 There is in fact no noticeable concern in the Bond / Capital market over the potential technical US Treasury default on 2 August 2011. The second curve below in Curve graphic 2 illustrates this fact of the 3 Month bills trend since 28 February 2011 to 29 July 2011. 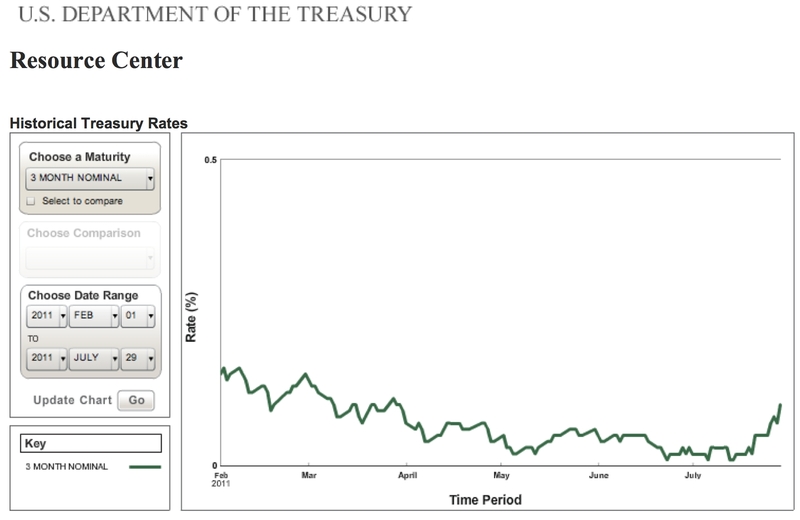 As can be observed, in the last few days a very slight spike has been observed, yet the rate at 0.10% is still below the 0.15% rate of 28 February 2011. It will be interesting to observe and track the trends over the coming days, especially as we kick off August and Debt Ceiling D-Day in the US congress and Senate. The US Treasury Yield Curves #2 – Do you factor inflation into the deal? Hi, I do think this is a great web site. I stumbledupon it 😉 I’m going to return yet again since i have book marked it. Thanks for posting these charts. It’s very helpful to see. It’s surprise that given all the talk of the end of the world hysteria by the main stream media that bond yields haven’t exploded to the upside. It looks like me there’s a chance we’ll test the low’s on the yield for the 10 year treasuries. That will further drive down overall interest rates and mortgage rates. Thank you for your supportive comments. We intend to publish the negative Yield curves mentioned in our post on Monday. Good to see that we are achieving one of our stated aims, which is to “Inspire vision, direction, clarity of economic thought…” and therefore to improve the overall financial literacy of people. No doomsday scenario as far as we can tell, but observing the politicking going on in the States from this ‘side of the pond’ is quite interesting, because the potential repercussions for the global economic eco-system is quite frightening (should we play out the worst case scenarios everyone else envisages).